Before you start: This meal will take 40-45 minutes to prepare. Despite the extra time, we think it’s the perfect meal for this time of year: warm, filling and loaded with tasty goodness. Arborio rice is a short-grain variety that when cooked, releases starches to become creamy. A tasty consequence of this cooking behaviour is that the rice will absorb flavours around it and create a delicious creamy texture. Happy cooking and share the moment #youplateit with us on Instagram. Preheat oven to 180°C. Boil kettle. Medium dice pumpkin into 1-2 cm pieces. Line in a baking tray with baking paper. Place the pumpkin on the tray and drizzle with olive oil. Toss to combine. Bake for 20 minutes or until tender. Boil kettle. Peel and mince the garlic. Thinly slice the mushrooms. Small dice ¾ of the onion (you will have remainder). Mix vege stock concentrate in 2 cups of hot water. Heat olive oil (enough to cover the base) in a pot of medium-high heat. Add onion and garlic and cook, stirring, for 5 minutes or until onion softens. Add the rice and cook, stirring, for 2 minutes or until the grains of the rice appear glassy. Add the wine and cook, stirring constantly, 1-2 minutes or until the wine has been absorbed. Add ½ cup of stock to the rice mixture and stir constantly until the liquid is completely absorbed before adding more. Continue adding ½ cup of stock for 20 minutes or until the rice is tender yet firm to the bite and risotto is creamy. Add extra water as required for rice to be cooked. Place pine nuts in a pan over medium-low heat. Toast until fragrant and golden brown, stirring continuously, 1-2 minutes. Remove from pan. Add olive oil then increase heat to high. Add the mushrooms and cook, stirring, for 3-4 minutes or until lightly browned and tender. Transfer to a bowl. 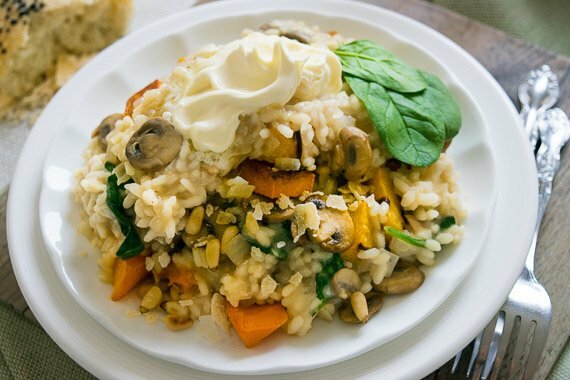 Add the mushroom, roasted pumpkin, parmesan and half of both the spinach and pine nuts to the risotto. Stir to combine. Divide the risotto among serving bowls. Spoon over the mascarpone and sprinkle with remaining pine nuts and spinach. Enjoy!